General Motors, whose shares have fallen this year, is starting to attract some hedge fund managers. BOSTON (The Street Ratings) -- General Motors (GM - Get Report), which launched one of the biggest IPOs in history last year, has made a turnaround, increasing profits four-fold in the most recent quarter. While the improvement has been impressive, investors haven't been as optimistic, pushing the shares down about 15% since the beginning of the year. As a result, some hedge fund managers are now sensing value in GM, as the top 20 hedge fund holders added almost 15 million shares, or $450 million in market value, in the first quarter. Fir Tree Inc., the largest GM hedge fund investor on record, picked up 2.5 million shares. In comparison, the top 20 hedge fund holders of Ford ( F - Get Report) added 6.8 million shares, or $100 million in market value of the more profitable U.S. carmaker. If there's a winner and a loser among Ford and GM, which is which? To gain perspective, here's what 10 other prominent hedge fund managers were doing as of March 31, according to filings with the Securities and Exchange Commission released this week. Pennant Capital Management: Added 1.2 million shares, bringing its total position to 3.8 million shares, or a market value of $57 million. Greenlight Capital: Was the third-largest holder on record as of March 31. The hedge fund, run by David Einhorn, initiated a new stake of 3.4 million shares. Perry Corp.: More than doubled its stake, purchasing nearly 1.25 million shares. Atalanta Sosnoff: Now the seventh-biggest hedge fund holder of GM, the firm initiated a new position 2.8 million shares. Taconic Capital Advisors: Sixth-largest hedge fund investor in GM. It added 2.7 million shares, making for a total of 3.2 million shares. Valinor Management: Added 1.25 million shares, and now holds 1.85 million shares. Diamondback Capital: Purchased 1.1 million shares, bringing its stake to 1.5 million shares. 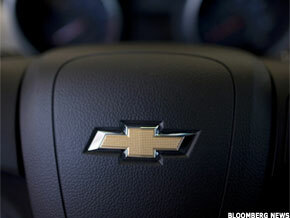 Oz Management: The biggest hedge fund seller of GM, the fund sold 5.8 million shares, and now holds only 1.5 million. Peconic Partners: Initiated a new position of 1.1 million shares. Two Sigma Investment Management: Sold 1.1 million shares, leaving its stake at just 900,000, or a market value of $28 million. GM is gaining favor among big hedge funds, due to improving fundamentals and a more attractive valuation. While TheStreet Ratings' quantitative model doesn't rate GM (due to a lack of historical financial data), the model has a "buy" rating on Ford. Ford has a $20 target, offering 33% upside from the most recent close. This is driven by a number of strengths, which we believe should have a greater impact than any weaknesses, and ought to give investors a better performance opportunity than most stocks we cover. The company's strengths can be seen in multiple areas, such as its notable return on equity, solid stock-price performance, growth in earnings per share, increase in net income and revenue growth. We feel these strengths outweigh the fact that the company has a sizable debt load (yet management has taken great strides in improving the balance sheet). Ford improved earnings per share by 22% in the most recent quarter compared with the same quarter a year earlier. The company has demonstrated a pattern of positive earnings per share growth over the past two years. We feel this trend should continue. Some notable hedge funds have been attracted by Ford's prospects. Ivory Investment Management recently purchased 5 million shares, and Adage Capital Partners purchased 3.6 million shares. Columbus Circle and Atalanta Sosnoff, two of Ford's largest hedge fund holders, left their positions largely untouched in the quarter. Equity research manager Chris Stuart, CFA, joined TheStreet Ratings after working as a senior investment analyst with Merrill Lynch covering small-cap equity and alternative investment strategies. Prior to that, Stuart worked for One Beacon Insurance as an actuarial analyst and at H&R Block as a financial adviser. Stuart earned his bachelor's degree in finance from the University of Massachusetts, Amherst. He holds a Chartered Financial Analyst (CFA) designation and is a member of the Boston Security Analysts Society (BSAS) and the CFA Institute.